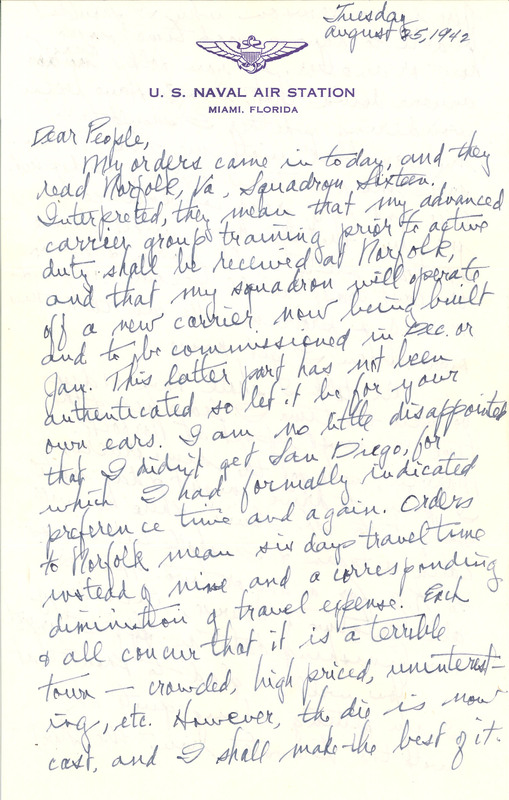 Tuesday August 25, 1942 U. S. NAVAL AIR STATION MIAMI, FLORIDA Dear People, My orders came in today, and they read Norfolk, Va, Squadron Sixteen. Interpreted, they mean that my advanced carrier group training prior to active duty shall be received at Norfolk, and that my squadron will operate off a new carrier now being built and to be commissioned in Dec. or Jan. This latter part has not been authenticated so let it be for your own ears. I am no little disappointed that I didn't get San Diego, for which I had formally indicated preference time and again. Orders to Norfolk mean six days travel time instead of nine and a corresponding diministion of travel expense. Each & all concur that it is a terrible town - crowded, high priced, uninteresting, etc. However, the die is now cast, and I shall make the best of it.